Create a clear vision of who’s in your blog audience. If you don’t have the audience you’re targeting at this point, develop a picture of whom you want in your audience. You don’t actually have to draw a picture, though. You can create this profile in words that describe the characteristics of your ideal audience member. You can include anything that you want in this profile, from shoe size to personal hang-ups — any detail that helps you really know this person better and create content for this person on your blog. Don’t just say, “My ideal audience is anybody who is interested in [insert your blog topic here].” You already know that. Otherwise, this person wouldn’t be on your blog in the first place. You want to capture all the details that make this person different, unique, and interesting. Take Gizmodo. 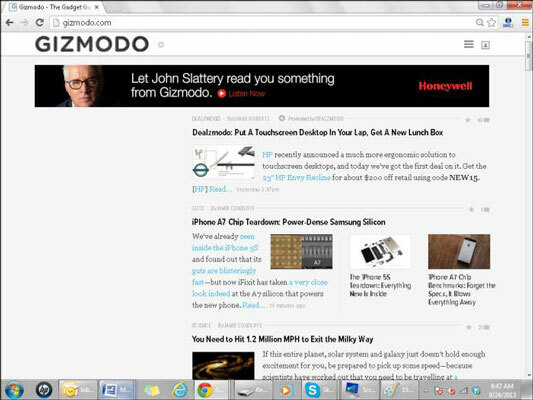 Gizmodo is a techie blog featuring information on gadgets and other nifty technical devices. The blog’s tagline is “Gizmodo, the gadget guide. So much in love with shiny new toys, it’s unnatural.” Right away, you know that the audience for Gizmodo is more than just those interested in gadgets. Gizmodo readers adore gadgets, see them as playthings meant to entertain and amuse, and are perhaps unhealthily engaged by them (maybe at the expense of other hobbies and pursuits). And those audience members want their gadget news piping hot, fresh off the presses. Doesn’t that tell you more about what kinds of posts will work best to attract and keep these kinds of readers? When you have a reader profile in hand, you can be more targeted about what you choose to write about and how you address that audience.